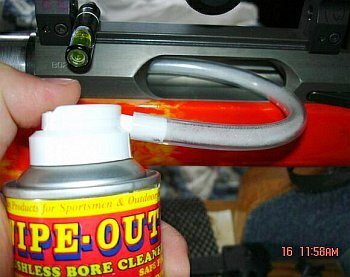 Standard procedure with Wipe-Out is to insert your O-ring cleaning rod guide into the chamber and then squirt through the muzzle. However, this isn’t possible with all rifles. One of our readers wanted to try Wipe-Out, but he has a Remington 7400. This is a semi-automatic rifle with no pass-through in the rear of the receiver. There’s no way to insert a guide rod, and it’s also tricky to use a chamber plug. 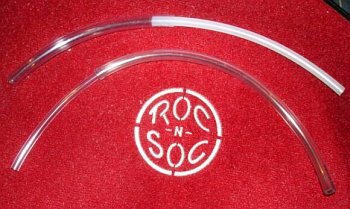 For rifles such as the Garand, M1A and other semi-autos, you can apply Wipe-Out through the breech if you use fitted, plastic tubing. Jason Baney has written a short article describing this process. In a nutshell, you need one piece of tubing that fits the chamber tightly and then connects with a second, smaller diameter tube that attaches to the Wipe-Out can. This avoids any “over-spray” of foam in the action area, providing a clean, simple solution. Just squirt for a second or so, and wait for white foam to come out of the muzzle. Be sure to keep Wipe-Out off fine wood stocks. Share the post "Wipe-Out: How to Apply from the Breech"